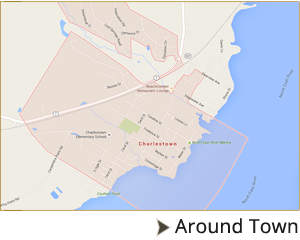 Signs are posted for areas that are permit only or tow-a-way zones in Charlestown. Town residents may stop by Town Hall to pick up their free vehicle permits. Current town resident permits are perpetual and need not be renewed every year. Non-town residents may purchase a yearly parking permit for $50 or may park for free at the end of Water Street in Lot B. Permits are available from Town Hall Monday through Friday 8-N and 1-5.